Hello. My name is Kyle Prettyman and I am the loving father of Alana Rose Prettyman. I am the other founder, and President of the Alana Rose Foundation. Through the hard journey that we endured with Alana, I’ve learned the true meaning of undying love for a child. Alana taught her mother and I so much about life and love in her in short time here on earth. We could have never learned it in a lifetime without her. During our stay at the hospital, we saw there was a need for children that was not there, a parents love and touch. Instead, hospital volunteers or nursing staff trying to be a mother or father figure and a caring hand, stood at their bedside. We found money and financial needs was the reason behind the separation of the parent and child. These children were very, very sick. We decided to help these parents spend their time with their terminally ill child rather than working and stressing about financial obligations. With all the financial support we received from the community to help us spend her last 7 months together, and knowing what a life changing thing it really is, we knew we had to help families going through similar experiences, so we did. As President of the foundation, I find new opportunities to expand our foundation. I seek new sponsors and donors through my resources and the help of our team. I assist with all planned fundraisers and events. As president, I oversee all operation of the foundation as well. Although we would like for families to not be in this situation, we are happy to watch Alana live on by helping so many families in need. Thank you for supporting us and helping us make a real difference in this community and beyond. Hello everyone, I am the loving mother of Alana Rose Prettyman. I am one of the founders and the Vice-President of the foundation we created to honor our daughter and make a difference in this world with the legacy she left behind. I knew we were called to help other families struggling through similar experiences. I received a fortune cooking prior to starting this foundation that read “You have the ability to change the lives of many people”, and I took that as a sign from God. Because of this foundation, we know our daughter’s life still matters. We know that because of Alana, many families can cherish the little time they have left with their terminally ill child. Alana took her last breath in my arms, and I couldn’t imagine not being there for her and to tell her goodbye. No child should fight alone, and all families need each other to stay Family strong. As far as my role in the foundation goes, I am the Vice-President. I oversee all operations, plan all fundraisers with the help of my event planner. I receive all donation requests immediately via email and approve them through our Financial Advisor. After the decision is made, I write the checks to help with financial assistance to help parents afford to be with their child. I reach out and help families in need locally in Delaware, and other states, with the help of the Social Workers at A.I Dupont, and our Licensed Patient Advocate. I personally offer emotional support to the families we financially assist, through our own experience. I continue to expand my knowledge by taking workforce development classes in networking, social media and business to build more knowledge and awareness about our foundation and our daughter. 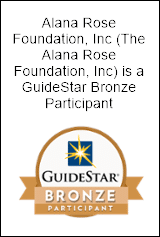 I also work with my team to make The Alana Rose Foundation as successful as possible. May Alana’s life forever hold a place in many people’s hearts.